If you’ve had your head in the clouds or have been living under a rock for the last four months, you might not know who Josh Donaldson is. “Well, he’s a madman,” Toronto Blue Jays manager John Gibbons said - accurately. Donaldson is the third baseman for the American League East-leading Blue Jays, and the major-league leader in RBIs (111) and runs scored (104). He is also second in slugging percentage (.589) and third in home runs (36). He’s also the aforementioned madman who tags up from third on a pop fly to the second baseman and scores with a ridiculous diving slide, which he did without flinching in a 5-1 win over the Cleveland Indians on Wednesday. Fans follow his every move with “M-V-P” chants, and the 29-year-old slugger has asserted himself as the favourite for baseball’s highest individual honour. In what has become a special season for the club - poised to end a 22-year playoff drought - Donaldson is putting together one of the greatest individual campaigns in franchise history. "It's gotten to the point where nothing this guy does surprises you anymore. He's a super hero, really. He's in a special place right now." His staggering power numbers speak for themselves and his value in the new age of advanced statistics places him among the greatest Jays of all time. Wins Above Replacement, or WAR, is an advanced statistic that incorporates batting, baserunning, fielding and pitching to estimate how many additional wins a particular player is worth to his team over a replacement-level player. Donaldson sits atop the American League with a 7.6 WAR, while the next closest player on the Blue Jays is Edwin Encarnacion at 3.2. No other teammate is above 2.8. If the season were to end today, Donaldson’s WAR would rank as the third-best in franchise history behind only John Olerud (7.7) and Jose Bautista (8.1). Olerud hit .363 with 24 home runs and 107 RBIs in 1993 while Bautista batted .302 with 43 home runs and 103 RBIs in 2011. Donaldson likely won’t touch the .363 batting average, but his current pace leaves him needing only seven home runs in 30 games to pass Bautista’s home run total. He has already topped the RBIs and runs scored of those historic seasons. 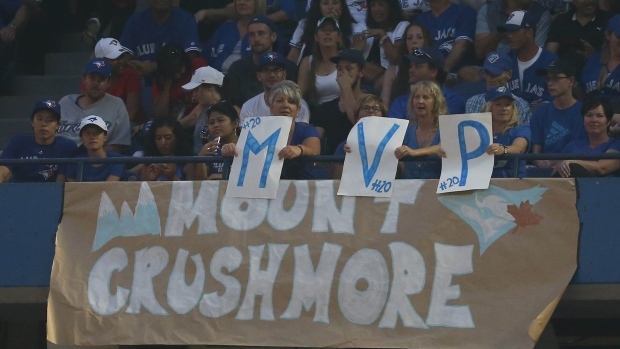 But the Blue Jays and their fans have had heroes before. From Dave Stieb and Roberto Alomar to Roy Halladay and Carlos Delgado, the franchise’s history of great players is a deep and giving well. Even Bautista, acquired by the Blue Jays midway through the 2008 season, has earned himself a spot on the Level of Excellence at the Rogers Centre once he decides to hang up the cleats. Aside from the potential to set a franchise record in WAR, Donaldson isn’t approaching any other Blue Jays bench marks with his numbers. What he is doing is making it all look easy. As mentioned, his most recent moment of jaw-dropping ability was scoring from third on a pop out to second base, but that wasn’t even his only stroke of genius on Wednesday. In the same game, Donaldson hit a sharp line-drive to the left fielder and made a sharp turn around first base, thinking, but not committing, to trying for second. Catching the fielder off guard, he went from a near full stop into a full sprint, swiping second from the unsuspecting Cleveland defence. No problem. A night earlier, with the Jays down 1-0 in the bottom of the fifth and men on first and second, Donaldson battled with Cleveland starter Danny Salazar to a full count with two outs. One swing turned the at-bat into a two-run triple. Donaldson slid into third safely and shot up from the dirt with a pumped up chest and the Blue Jays famed “cooking” symbol. He’s done just that. 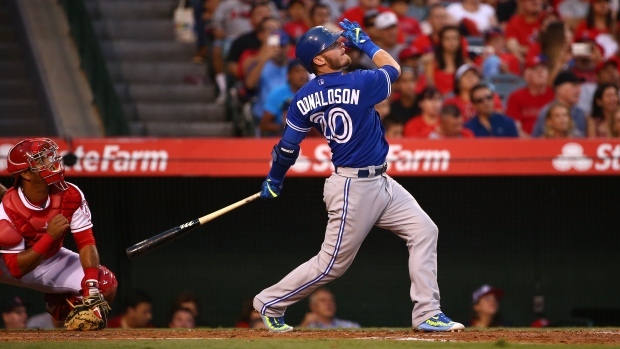 With his bat, his glove, his arm and his intensity, Donaldson has put the Blue Jays in a position to win every night.